Tick the check box to activate screen OCR automatically during typing. The text acquired from screen OCR will be used to promote the prediction accuracy. Set the minimum length of words to be cached from OCR text. There is no need to cache very short words. NOTE: If you set the value to , this means no words will be cached, but the existing entries can still be used for prediction. 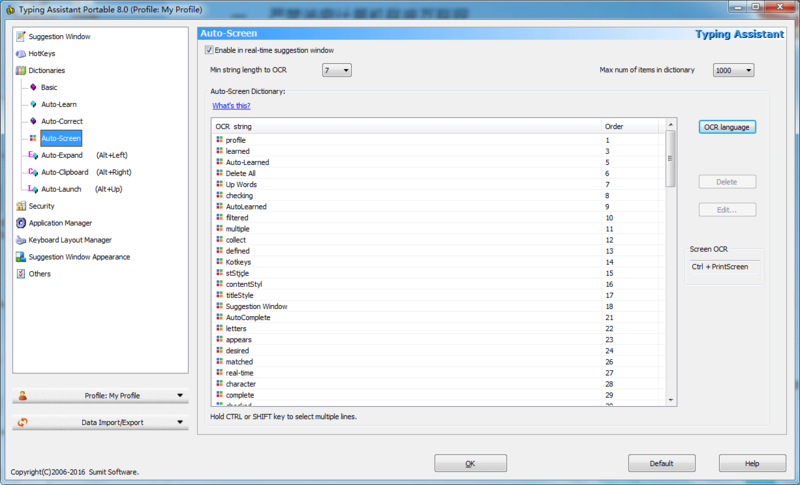 Set the Max Auto-Screen words number to cache. Set languages for OCR processing. If an item is OCRed by mistake, you can edit or delete it here. Press the predefined hotkey to activate screen OCR. This hotkey is defined at "HotKeys" page. NOTE: Auto-Screen dictionary includes words and phrases acquired from the context window you typed recently. We get those text by Optical Character Recognition technique. So there may be misspelled words in this dictionary because of OCR fault. You can disable this dictionary by uncheck the option "Enable in real-time suggestion window" at the top of this page.